Last night we got to sit in and watch the 16 finalists in the BlackBerry Developers Challenge present their apps to a panel of judges (including CrackBerry Kevin) to see who would be crowned the winner and receive the grand prize of $100,000. It was a great night with some awesome apps, but when it came down to it, the 7digital Music Store walked away with the spoils. Runner up Nickel Buddy took away a $25,000 prize pack, and a new $5,000 prize was created on the spot for newcomer Kik. Press Release below. Nickel Buddy takes home US$25,000 runner up prize package for "Fierce Towers"
SAN FRANCISCO-November 10, 2009-At the "Final 16" event held last night at the BlackBerry Developer Conference, a panel of judges selected 7digital Music Store (by DevelopIQ) as the winner of the US$100,000 grand prize in the 2009 BlackBerry Partners Fund Developer Challenge. The runner up in this year's Challenge, Fierce Towers (by Nickel Buddy), receives a prize package valued at more than US$25,000. An on-the-spot honorable mention and US$5,000 prize was also awarded to Kik (by Unsynced). 7digital Music Store lets users browse the latest music charts, preview the latest tracks and discover, purchase and download high quality, DRM-free MP3 music directly to a BlackBerry smartphone. The software also comes with an integrated advanced media player that imports your existing playlists and music files. Fierce Towers is the first tower defense game for the BlackBerry smartphone. Control the field to stop the waves of attacking enemies as you place upgradeable towers around the field as you try your best strategies to stop wave after wave of invading enemies. Kik lets users find, manage and play music files stored on BlackBerry devices. "Narrowing down hundreds of entries to the final 16 was no easy task, and selecting 7digital Music Store as our grand prize winner and Fierce Towers as our runner up was even more challenging," said Kevin Talbot, Co-Managing Partner, BlackBerry Partners Fund. "Both the competition winners and the finalists in this year's Challenge exemplify innovation and reinforce why the mobile platform presents so many opportunities for both developers and end users." 7Digital Music Store and Fierce Towers were selected from among 16 applications that were presented and demoed to a panel of judges at the "Final 16" event. 7Digital Music Store was voted to be the most compelling product or service, backed by a clearly defined value proposition, and stellar technical execution. As an added bonus for this year's winner, 7Digital Music Store will also be entered into the GSMA Mobile Innovation Grand Prix competition that will be judged as part of App Planet during the 2010 Mobile World Congress. 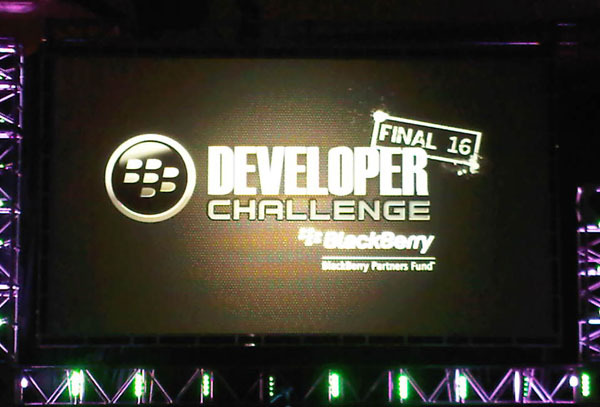 With a total prize package valued at more than US$250,000, the second annual BlackBerry Partners Fund Developer Challenge invited developers to submit their original applications to BlackBerry App World between June 1, 2009 and September 25, 2009. From a pool of hundreds of applications, a total of 16 finalists were selected over the four-month contest period. The finalists each received a prize package valued at more than US$5,000 and were invited to compete for the grand prize and runner up prize packages at the "Final 16" event. A complete list of 2009 finalists can be found at http://www.blackberrypartnersfund.com/09contest/finalists. The BlackBerry Partners FundTM is designed to deliver superior returns on the compelling investment opportunity in applications, services and supporting infrastructure for the BlackBerry® and other mobile platforms. The Fund's mandate is based on the premise that in the future smartphones will be powerful portable computers for use at home, work, and leisure. The Fund invests in companies developing applications that make smartphones a compelling platform for media, commerce, enterprise, entertainment, and lifestyle applications. The Fund is global in scope and will consider all stages of development. For further information visit: www.blackberrypartnersfund.com.